GV2000D Multi Deluxe16-gauge steel w/soft foam inside - Tamper indicator - Battery power w/connection jack for external power - No-Eyes Keypad - Motion detector with audio alarm - Interior light - Program up to 3 access codes - Out: 14" x 10.1" x 7.9"s.
The outside of the Microvault is constructed of heavy-gauge steel with soft foam on the inside to protect the pistol. High-strength lock mechanism performs reliably time after time. Precise fittings are virtually impossible to pry open with hand tools. Built-in computer blocks access after repeated invalid keypad entries. Conveniently located keypad is easy to use. Mounts almost anywhere. Four pre-drilled holes on bottom of vault. 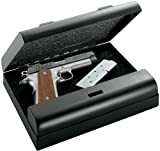 Outside of the safe is constructed of 16-gauge steel, while soft foam on the inside protects valuables. Tamper-proof, spring-loaded door. Also features audio and blinking LED low battery warning, interior courtesy light and power connection jack for external AC or DC power supply (adapter included), and mounting gear. Battery power supply lasts 1 year under normal conditions.